This is one of my early introductions in the 1990′s. It is the same plant as ‘Romantic Rose’ an unfortunate misnaming by an over zealous plant namer which ends up confusing the public. ‘Winter Lipstick’ is an evergreen which has large spikes of deep sugar pink flowers from May and peters out in November when it gets hot. A bad frost (-4C) will make the flowers drop but likely it will get itself going and start flowering again if the frost wasn’t too bad, because it has such a long flowering season. It is particularly useful for winter flowers and bird food. It bends fairly well with a heavy wattle bird on it. 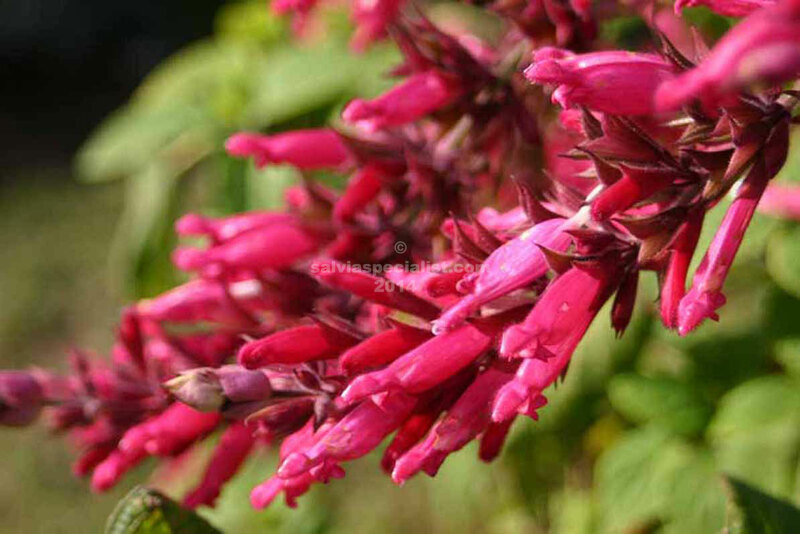 This salvia is great for hiding a shed or for back of the border. It has multiple stems but does not run or do anything unpleasant. ‘Timboon’ seems to be a shorter offspring which might suit smaller gardens. ‘Winter Lipstick’ can get to 5m after 3 years or so if unpruned. It is the tallest salvia I have grown. Karwinskiis tend to cross pollinate so there could be all sorts of variations along the way. This group of plants is easy enough to propagate using younger wood which is not hollow.